TIP: To maximize fun levels, go with a guide who regularly does the tour. Also, give yourself more days in case of bad weather. Understand that sitting out a storm at a hut might be necessary. This is the ski tour every ski tourer wants to do. 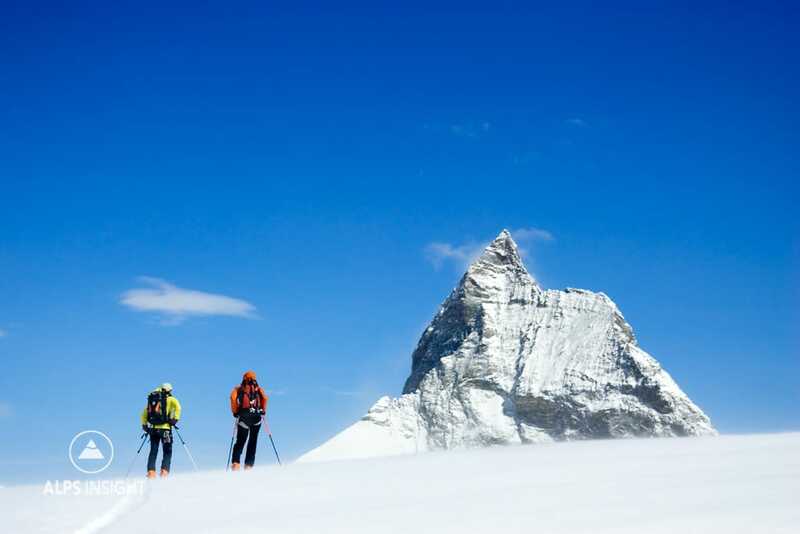 The Chamonix Zermatt Haute Route is the icon, the trophy, the dream ski. We've done it twice, but admittedly, not since 2005! And, we will do it again. What makes it so good? The place and the journey through. When I think back on it, my memories do not include much skiing, but they are full of the place and all the little things that make up the experience: dawn starts at huts and new views over each col.
Each spring, around late March, Chamonix swells with ski tourers. They come for the Haute Route. Some have plenty of experience to not have it be an issue, others are intimidated, checking and re-checking that all systems are a go with their guide. And, the guides are a big part of the experience. Most everyone will go with one because the route is complex. There is a huge amount of time spent on heavily crevassed glaciers, there are variations based on conditions, huts and transfers need to be organized, and of course the decision to go at all is dependent on weather. The standard Haute Route is six days. But, we'll call it an 8 day tour with the the Vallee Blanche and weather day. That's potentially eight straight days of skiing with no rest. Big days where fitness is a must. Many people I saw in Chamonix had just that, eight days. Stress levels were high as one day of bad weather can make things complicated, two bad days and plans have to be changed. It's the nature of the Haute Route. It's long, and so it requires a lot of good luck. That's all part of the deal of getting yourself from Chamonix to Zermatt. Again, it's the journey. What about the skiing? 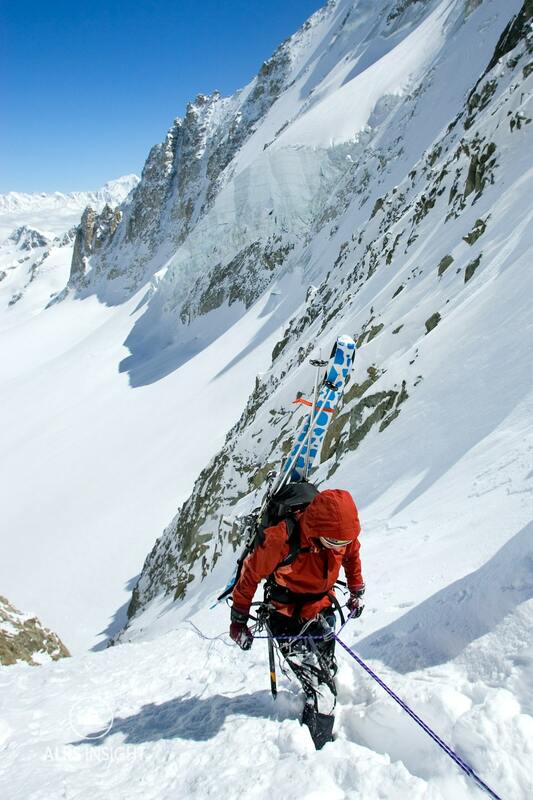 There are two standard options: 1) The Traditional Haute Route and 2) The Skier's Haute Route. Some guides offer further variations, or side trips with ski peaks, but generally speaking these are the two routes. We've done both versions and don't favor one over the other. Both are great. The two routes are much the same except for a mid-tour variation. Both tours start the same way, by climbing two cols through the high drama that is the Chamonix landscape. The first night is spent at the Trient Hut, perched along the rim of a huge ice cap, the Trient Plateau, rimmed with granite peaks and walls. On the second morning, you'll drop 1600 meters to the village of Champex where, after a mid-morning tart and coffee, everyone and their gear piles into taxi vans for either Verbier (the Skier's HR) or the village of Bourg St. Pierre (the Traditional HR). If you go to Bourg St. Pierre, your day is done when you reach the tiny hotel. If you opt for Verbier, you'll have a long tram ride and short ski to the Cabane du Mont Fort. For the following morning, when you depart Bourg St. Pierre, your day is nothing but up (1400 meters!) 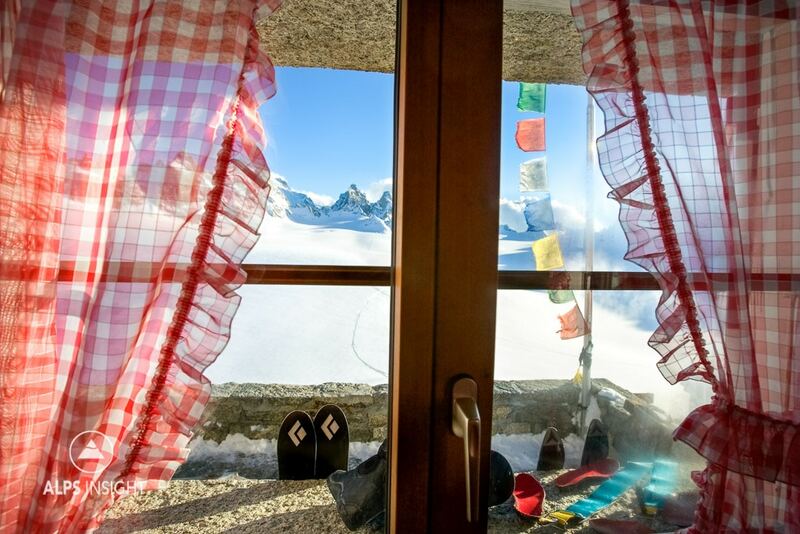 until you reach the Valsorey Hut on the southwest shoulder of the Grand Combin. After a much deserved night's sleep, you'll get up very early the next morning and keep that uphill momentum going, for another 600 meters. But it's here, during all this uphill (quite steep in fact) that memories are made. The reason is the place - it's fantastic. So, appreciate that up, especially because you know what the reward must be after 2100 meters of uphill. Hopefully conditions are good because you'll be pointing your skis at the Chanrion Hut from far above. From the Chanrion Hut, the original Haute Route's standard route has shifted to the Les Porton, a far more attractive climb than the long trudge up the seemingly endless Glacier d'Otemma. This route allows access to the Col du Brenay and the Pigne d'Arolla, from which you have a nice descent to the Vignettes Hut. The Vignettes Hut is one of those places you see on Instagram. 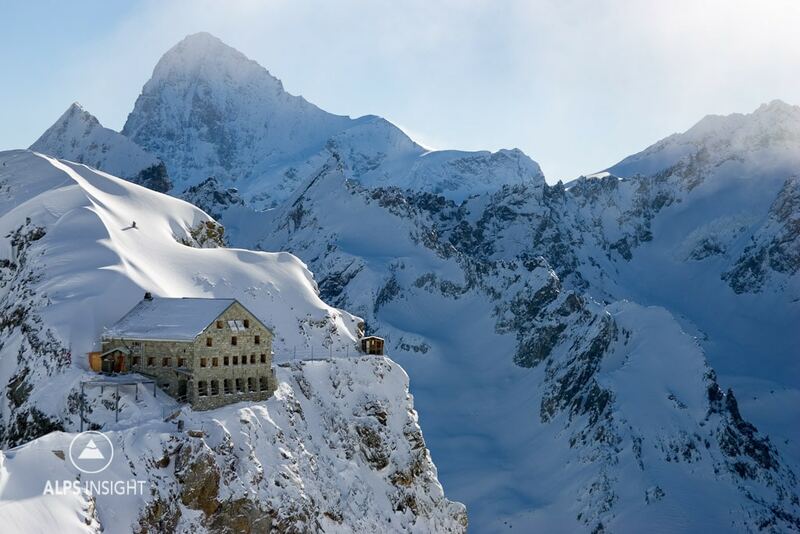 Perched on the side of a cliff over glaciers, the hut, for whatever reason, seems to be the crux of the tour. Not because it is difficult around the hut, but because at this point, if you've been enjoying sunny skies, it may be time for a change in the weather. Talk to most anyone who's done the Haute Route and they'll tell you, "We had to bail down to Arolla from the Vignettes". If you're lucky enough to not have this problem, then get some sleep because the next day is a big one. Day 6 on the Haute Route requires three climbs before you are staring down the valley into Zermatt. 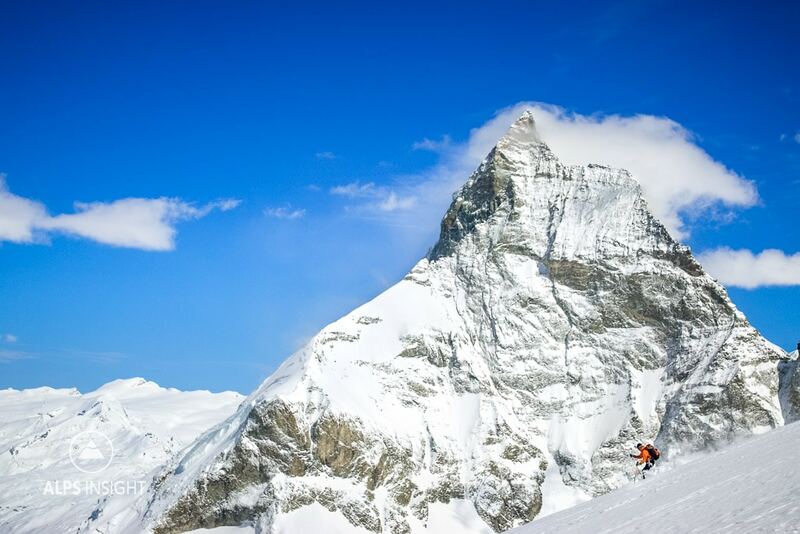 It's an all around brilliant day as you huff and puff over high, glaciated cols, beneath 4000 meter peaks, and finally lay eyes on one of the world's most stunning mountains, the Matterhorn. Once you bang out this day you'll surely find yourself planted comfortably in a chair with a view, a frothy beer at the ready, and a huge smile on your sunburnt face. The difference between the two routes is that the Skier's Haute Route has less massive ups with more even terrain to balance the ups and downs, and to spend more time skiing. Maybe you'll ski more and do less "ski mountaineering", or maybe not. This route is easier, allowing more time for a guide to offer ski peaks based on how things are going. Once you re-connect at the Vignettes Hut, you are back on the Traditional Haute Route schedule. *Alternatively, fast parties can skip Praflueri by going straight to the Dix. This saves a day. But, be warned...! The approach to the Dix is on an exposed southeast aspect which is very prone to afternoon slides. Do not approach the hut unless conditions are favorable. Will you need a guide? Most certainly, YES! I'm not even going to bother presenting any additional info because there is simply too much, and too many options, variations, and considerations. Not only is the route difficult, but you need to get into huts, and adjust them if weather causes delays. Simply moving between huts is the tour, but there is so much more that can be done: side valleys, peaks, even hut options. Talk to 10 different guides and you might get 10 different options. This is a case of trusting experience. 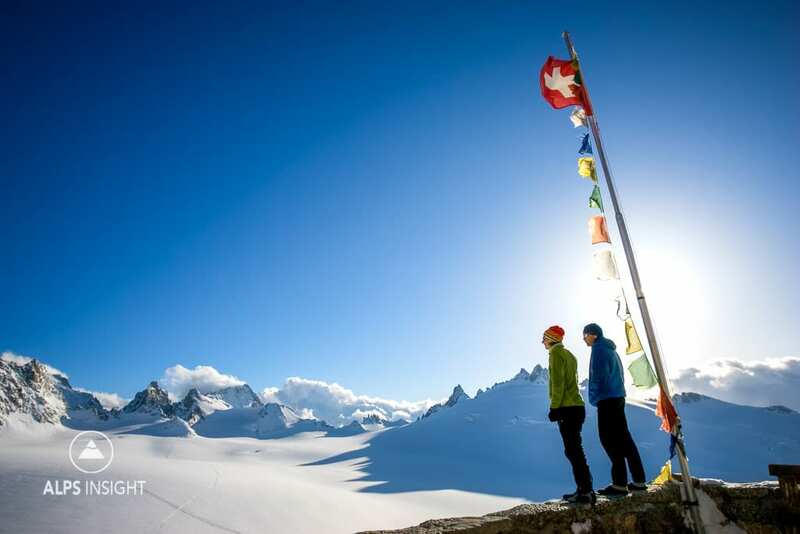 If the Chamonix Zermatt Haute Route is for you, we can help connect you to a mountain guide who knows the tour. Day 1: After a long skin up the Col du Chardonnet, many choose to rappell from the col to the Glacier de Saleinaz. Day 1: Looking out at the Plateau du Trient from the Cabane du Trient. Day 1: The cozy Cabane du Trient. Day 4 on the Traditional Haute Route : Skinning the Col du Sonadon from the Plateau du Couloir in classic Haute Route terrain. Day 3 on the Skier's Haute Route : Headed for the Prafleuri from Montfort with views of the Grand Combin. Day 6: First views of the Matterhorn from the Col de Valpelline. Day 6: Dropping into Zermatt next to the Matterhorn. We would love to do the Haute Route around the Easter period (18-23 April). 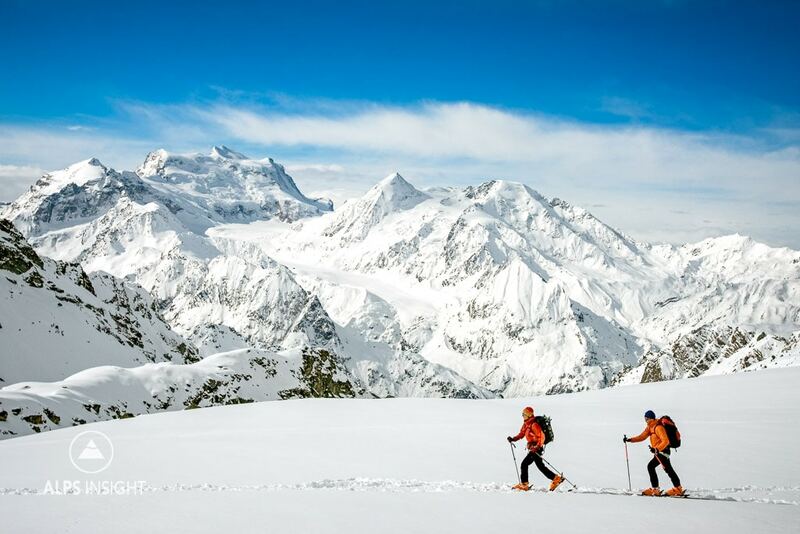 It is two of us and we have significant ski touring/ ski mountaineering experience. We did the Urner Haute Route, part of the Spaghetti tour, Mont Blanc without a guide and we often do skitours around Switzerland at the weekend (1000m+ elevation gain). 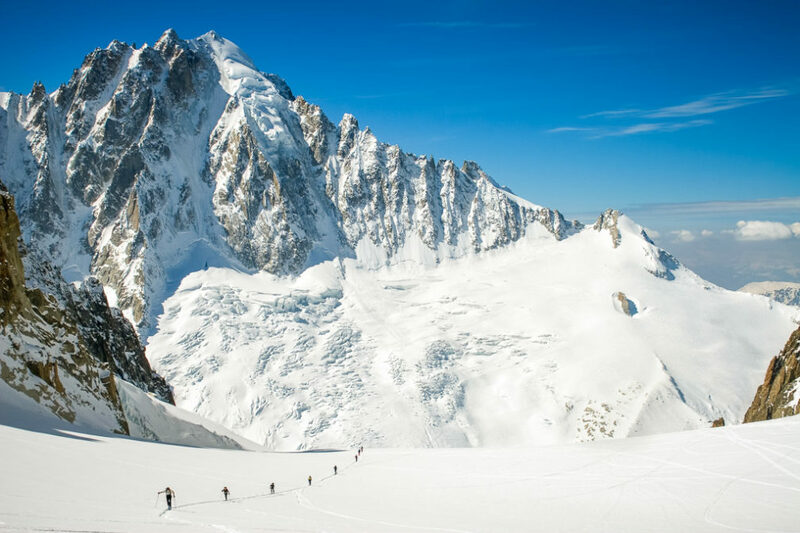 To make the most of the experience, we would like to hire a guide for the Haute Route. I understand the route is very busy. 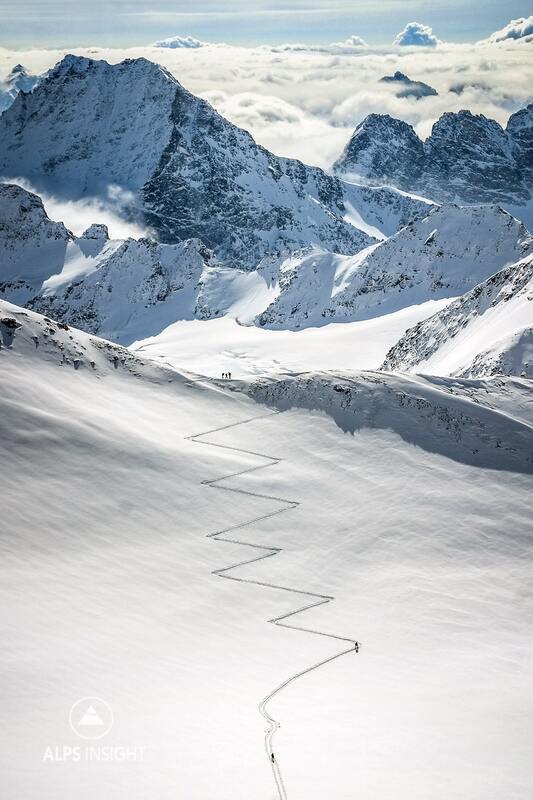 Would it make sense to do it backwards, ie Zermatt to Chamonix? What are the cons of doing it that way? Do you have a guide that could take us and what would the cost be? Hi Maddalena, Great! Thanks for writing! Yes, we are happy to help.